Take a bite out of the 95-mile Tonto Trail on this 13-mile section. Descend the Bright Angel Trail from the South Rim to Indian Garden. Near the hitching posts, follow the signs toward Tonto West and Plateau Point. The trail crosses Garden Creek, swings over to the west canyon wall, and contours along the shale slopes for three-quarters of a mile. At the Y junction, veer left onto Tonto West; right takes you to Plateau Point. Though not visible from the trail, remnants of an old uranium mine litter the head of the Horn Creek drainage on the South Rim. The Orphan Mine, originally patented for its copper ore in the early 1900s, became a productive uranium mine during the Cold War. When the park service acquired the abandoned site in 1987, they also inherited the land’s toxic legacy. 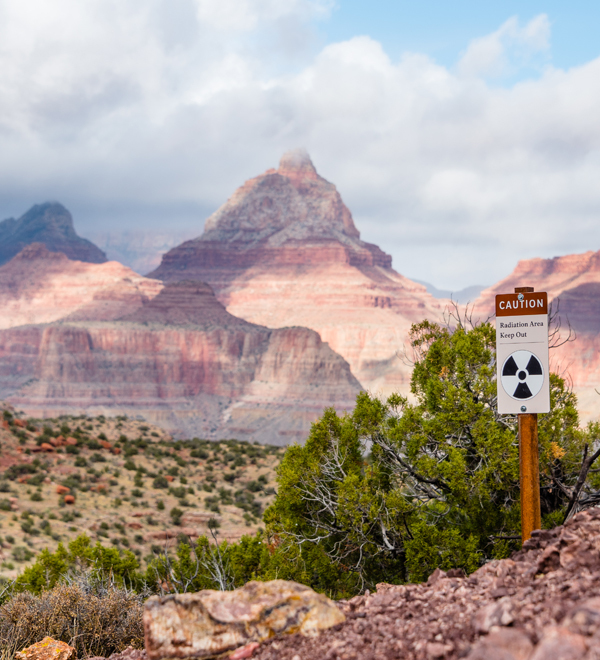 In 13 years of mining uranium on the South Rim, the Orphan Mine allowed dissolved uranium to leach down Horn Creek, contamination that continues to this day, thus the need for warning sign. After crossing the boulder-choked west arm of Horn Creek, the trail starts to bend around Dana Butte. Here, the Tonto Trail’s flat reputation falters briefly, as two small ridges force you to climb up several hundred feet. But from the north side of Dana Butte, the trail resumes a fairly level character, and you continue wandering west along the blackbrush-studded bench. You can catch a few glimpses of the Colorado River before the trail hooks back into the Salt Creek drainage and descends through the ledgy Tapeats Sandstone. Around 7.3 miles, you drop to the gravel creekbed. Walk a short ways upstream, looking for a cairn marking the route up the opposite wall. Continue past signs for the Salt Creek campsites and composting toilet, and make your way back up to the Tonto Platform. Proceeding west from Salt Creek to Monument Creek, the trail winds in and out of small gullies and drainages. Pass Cedar Spring (unreliable) and continue for a few miles before reaching a steep descent into Monument Creek. 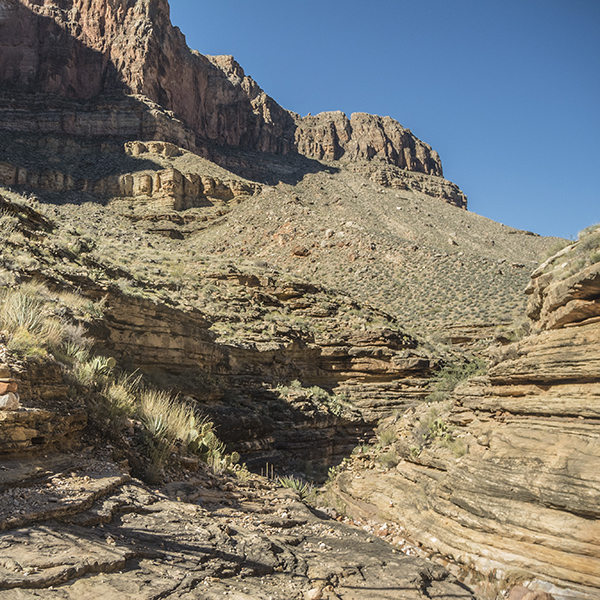 The trail switchbacks down the Tapeats ledges, cutting all the way into the Grand Canyon’s basement rock — the ancient Vishnu Schist. When you reach the east arm of the creek, look for cairns marking the route across it. Campsites, tucked between bushes and trees, line the creek, and reliable water is a short walk downstream. As you make your way over to the west arm of Monument Creek, you pass the namesake “monument” — a cylindrical pillar of sandstone. Follow cairns up the dry streambed, keeping a close eye out for the exit route up the east canyon wall. From here, the trail gradually climbs back up to the Tonto Platform, topping out at a small saddle north of Cope Butte. In three-quarters of a mile, you intersect with the Hermit Trail. Since the Tonto Trail starts 3,000 feet below the rim, driving to the start of the trail is not an option. You must get there by foot. See the Bright Angel and Hermit trail descriptions for access information to this section of the Tonto Trail. Fee required – Camping below the rim requires backcountry permits and additional fees. Check the website below for current information.